Fibermesh 150 multi filament offers superior plastic crack control in concrete at our standard 1 lb. dosage rate. 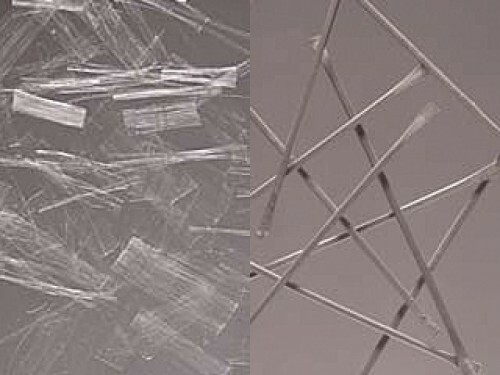 Fibermesh 300 has been the world’s leading micro fiber for over 20 years. Dosed at 1.5lbs., Fibermesh 300 goes beyond just plastic crack control, offering residual strength in the hardened concrete as well. Fibermesh 300 has been used on an estimated 40 billion square feet of concrete as an alternate system to 10 gauge (W1.4) WWF. Fibermesh 650 macro synthetic fibers at a 3 lb. dose is often used as an alternate to 6 gauge (W2.9) WWF. In 1998 the Fibermesh family grew beyond just synthetic fibers when Novocon International was purchased, a manufacturer of steel fibers. This allowed the already popular Fibermesh brand to become even stronger, offering steel fibers and today’s popular blends. The benefits of blended fibers are great because different fibers affect the concrete at varying stages throughout the life of the concrete. The first combination offered was Novomesh 850, a blend of both steel & micro synthetic fibers packaged in a 24 lb. bag. Novomesh 850 has a UL rating and has been used in millions of square feet of composite metal decks in Wisconsin and throughout the world. The most popular blend in Wisconsin today is Novomesh 950, a blend of macro & micro synthetic fibers. Packaged in 5 lb. bags, this fiber has performed beyond many users’ greatest expectations. We have placed many slabs throughout Wisconsin with Novomesh 950 in lieu of rebar. The age-old challenge of curling in concrete slabs has been tackled head on with dosage rates of 7.5 lbs. of Novomesh 950 while eliminating control joints. This has been used on many gymnasium floors with great results. In Wisconsin we currently have slabs 100’ X 100’ with no control joints and NO VISIBLE CRACKS 3-4 months later. ** To achieve these results we encourage you to meet with a representative to discuss your objectives and risks. Novocon 1050 steel fiber has been a proven leader for heavy industrial applications for over 20 years. Used in lieu of 1 and 2 mats of rebar in slabs on grade. Contact us now and learn which fiber reinforcement is appropriate for your construction application. Learn how you can save time & money while guaranteeing your reinforcement is correctly placed every time.